World War II will always remain fresh in the minds of these four Eau Claire men. They were serving in the Philippines when the Japanese bombed Pearl Harbor Dec. 1, 1941. They were ultimately captured on the Bataan Peninsula and spent four years on prisoner of war camps in The Philippines and Japan. 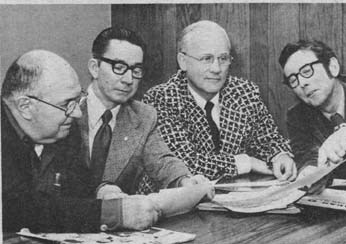 From left are Ervin Keilholz, John Hryn, John Bruer Jr. and Clifford Omtvedt. Millions of Americans have been killed, wounded and suffered misery in defense of this country during its 200-year history. Four Eau Claire men fought only briefly in World War II, but it marked the beginning of four years of torture, beatings and misery. Their fight was brief because America was ill-equipped and not prepared when the Japanese struck Pearl Harbor Dec. 7, 1941. All four were serving in The Philippines and were captured when it fell. They were in the infamous Bataan Death March. One escaped only to be recaptured later on Corredigor. Two of the men, John Hryn, 128 W. Tyler Ave., and John Bruer Jr., 930 Maple St., were serving at Nichols Field, Manila, but didn't know each other at the time. The other two, Clifford Omtvedt, 107 Vale Lane and Ervin Keilholz, 1433 E. Clairemont Ave., enlisted together March 19, 1941, and were serving at Clark Field when the Japanese struck. Keilholz, Omtvedt and Hryn survived the Bataan Death march were thousands of Americans and Filipinos died. Bruer started on the march but escaped and made his way to Corregidor where he served until it fell May 3, just 25 days after the April 9 fall of Bataan. That was the beginning of four years of horror, starvation, beatings and humiliation by their captors. So it was with some feeling of righteousness that Bruer saw the second atom bomb dropped on Nagasaki, Japan, April 9, 1945. It was three days after the first was dropped on Hiroshima. Bruer and Keilholz were in Prison Camp No. 17, near the city of Omuta on the Island of Kyushu, about 14 miles across the bay from Nagasaki. "I heard the drone of planes," Bruer remembers, "and all of a sudden I saw the mushroom and then heard the noise of the explosion. I didn't know what it was at the time, but thought, boy, they really hit a big ammunition or gasoline dump over there. Prison Camp 17 was a coal mining camp and prisoners served long hours in the mines. Keilholz was working in the mine when the bomb was dropped and Bruer told him about it when he came off shift. Bruer said their prison camp was bombed two or three times by Americans and about a third of the camp was burned down. "The Japs had constructed large dugouts which could hold about 500 people each," he said. "We know we could get in them but could not get out. "Each dugout had holes through the top and the Japs said we would be locked in them and gasoline poured in to burn us if Japan was invaded. We felt that if it wasn't for the atom bomb we all would have gotten it." Bruer, a native of Eau Claire, is a 1935 graduate of St. Patrick's High School. He was working at Sterling Pulp and Paper when he enlisted June 10, 1941, at age 23. He was ordered to Nichols Air Field in the fall of 1941 when he was on detached service with the 27th Bomb Group. When Japanese bombers struck Manila Dec. 8, there were only 14 P-40 fighter plans in condition to fly. The bombers were at the field but their engines and propellers were still in the Manila dock area awaiting shipment to Nichols. "Thee was virtually no defense and no warning of the attack," Bruer said. "All the fighter plains were destroyed and we were almost helpless as they (Japanese) bombed and strafed us." That evening, after the attack, Bruer's group went north to a small airfield at San Fernando. From there they were moved often and finally were backed onto the Bataan Peninsula by the advancing enemy. Bruer said, "We fought as infantry in Bataan and finally ended up at its southern tip at Mariveles, across from Corregidor. "I spent six weeks on M.P. duty guarding a three-span wooden bridge over the Pasay River. "The Japs landed near the tip of Bataan and after a four-day battle we drove them off. Every able-bodied man fought and afterwards we counted 313 dead Japs and only three of ours." When Bataan fell April 9, Bruer was rounded up with other captives and started on the march up the Bataan highway. "I knew the area and felt that if I could escape I could make it to the sea and perhaps be saved by a friendly ship," he said. Under the cover of night, he and a fellow from Louisiana escaped. They fled into nearby rice paddies where they remained until the next night. That night they made it to the jungle where they rested and ate berries and leaves. The next day they reached the coast. The two dragged an old log into the water and began drifting toward Corregidor. About 4:30 p.m., the crew of an anti-aircraft battery on Corregidor spotted them in the water and sent a launch to pick them up. "We saw a lot of sharks while we were drifting but thankfully they left us alone," Bruer said. When Corregidor fell, the survivors were taken by barge of Manilla. "The Japs paraded us up Dewey Boulevard to Bilibid Prison where we where held for about a month," Bruer reported. "We were then loaded into boxcars and taken to a prison camp called Cabanatuan No. 2. So many died there that they closed it and combined us with prisoners at Cabanatuan No. 1 about four miles away. It was there that I met Keilholz." Keilholz was 25 when he enlisted with Omtvedt who was 20. They took basic training together and were shipped to The Philippines in August, 1941. They were assigned to Clark Field as members of the 200th Coast Artillery and Anti-Aircraft Battery. The field was bombed Dec. 8, 1941, and a short time later the retreat began. The unit was reorganized and Omtvedt was sent to Manila while Keilholz stayed briefly at Clark. The retreat was by steps to the Bataan peninsula. On April 6, 1942, Keilholz was guarding a small airfield under construction when his unit was attacked and overrun. He was captured and was among the first to make the 65-mile march to Camp O'Donald to the north. Racked with malaria and dysentery and weak from hunger, the men soon began dropping. "The killing started immediately," Keilholz recalls. "Men who knelt to drink from caribou wallows were drowned by guards who held their heads under water. They were too weak to resist. "Others were shot and bayoneted. They were left where they fell to be crushed and pounded into the road by heavy trucks and military vehicles"
Upon arrival at Camp O'Donald, Keilholz was loaded into a boxcar with 149 other men and sent off on a six-day, 150-mile trip to Cabanatuan No. 1. "We didn't get any food and water and couldn't leave the boxcar until arrival," he stated. In the fall of 1943 Keilholz and Bruer were among the first 500 American prisoners of war shipped to Japan. The prison camp was the coal mining camp. "We worked from 16 to 18 hours a day in the mines. We got one day off every two weeks, then one a month and then none," he says. Keilholz and Bruer recall many beatings they and other prisoners suffered at the hands of guards. They were beaten with sticks, fists and anything handy and at the whim of guards. A favorite trick was to put prisoners into small cells without enough room to stand up. "They were given no food or water and many would drink their own urine," Bruer said. "There was no rhyme or reason for punishment or death. A lot of guys were bayoneted. The guards were sadists. Instead of going to the movies at night, they would call us out and beat us." On Aug. 6, 1945, the guards were suddenly gone and word spread that Americans were on the southern tip of the island. The two left camp and walked to the area where they met American troops. Their first meal was baloney - the first meat they had eaten in four years. "It tasted good," they said. It was the end of 1,248 days in prison camps for Keilholz whose weight had dropped from 190 to 89 pounds. He returned to Eau Claire and joined the fire department. He was forced to retire as a lieutenant May 12, 1966, after becoming crippled by arthritis. He is firmly convinced it is a result of his war experience. After being shopped to Manila, Omtvedt spent a month in that area until the unit began retreating to Bataan. He was in a field hospital with malaria when captured three hours before the April 9 surrender. The Japanese used the area to shell Corregidor and in return where shelled by the big 16-inch guns on the island. Three weeks later the death march began. Omtvedt marched in a later contingent that Keilholz. "By the time we started thousands had already passed over the route. Where they were killed, or dropped, they were crushed and pulped into the road by heavy vehicles. "Their bodies coated the road like bark on a tree. The smell was beyond description and the flies were awful," he reported. Omtvedt wound up in Bilibid Prison where he met Hryn in July, 1942. As a prisoner, Omtvedt worked as a stevedore, became ill, went back to prison camp and then worked two years and three months on an airfield construction detail. A native of Chicago, Hyrn enlisted when he was 19. He was a mess sergeant at Nichols Field. His unit gradually retreated into Bataan and surrendered April 9. He was on the death march three weeks earlier than Omtvedt and his description parallels Omtvedt's. He was sent to Camp O'Donald where he was on a road work detail. Later he was sent to another camp 300 miles away. "We started with 300 men and all but a handful died from dysentery," he said. He was at that camp about a month and then was sent to Bilibid where he met Omtvedt. On Aug. 15, 1944, the two were shipped to Japan with 1,135 men. The trip took 13 days and about 1,000 were alive when the ship landed at the Island of Mukiashima, near Honshu, Japan. They were interned there until Sept. 13, 1945, when they walked to freedom. Both suffered beatings and torture and trace current troubles to their experiences. Omtvedt had a back injury that still plagues him and Hyrn has back trouble plus a nervous stomach. 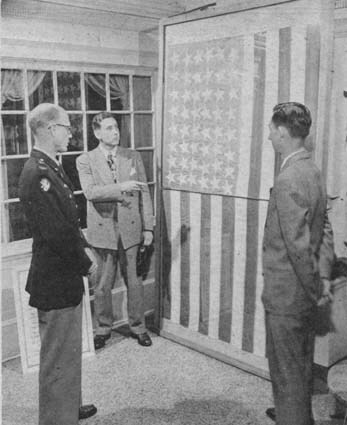 Clifford Omtvedt, center, and John Hryn, right, both of Eau Claire, show off a special flag in this photograph taken shortly after World War II. At center is fellow prisoner Col. Ralph Artman. The flag was made by Omtvedt, Hryn and other prisoners while in a POW camp in Japan during World War II. When liberation came, the freed prisoners raised the flag on the prison camp's flag pole. It was the first American flag to fly over Japanese after the war ended. It is now in a Ft. Lee, Va., museum. While in prison camp Omtevedt, along with other prisoners, made an American flag from red, white and blue parachutes used by American planes to drop food supplies. It was 11 a.m. Aug 18 when the Japanese lowered their colors and the makeshift American flag was raised. It went up before any American forces reached Japanese soil and was the first to fly over Japan at the end of the hostilities. It was raised daily until Sept. 13, 1945, when the prisoners marched to freedom. Omtvedt carried the flag at the head of the column. Omtvedt kept the flag and later presented it to the U.S. Government. It was placed in the Pentagon and is now in the museum at F. Lee, Va.
Hryn came to Eau Claire for a visit with the Omtvedts in 1947. He liked the city so much he decided to move here. One benefit of their imprisonment is the warm and lasting friendship forged through mutual experiences. In April of 1967 Hryn and Omtvedt returned to The Philippines to attend dedication of a memorial on Corregidor and to walk one mile over the route of the infamous death march. Keilholz was unable to attend because of his condition and Bruer said he didn't want to go. "To this day I have no desire to return," he said. Omtvedt said his return trip helped dispell a lot of bad dreams. The four are emphatic that they don't hold any bitterness. "It's best to forget and forgive, I guess," Keilhotz said. "I feel their (Japanese) actions were due to the way they lived, almost like they were brainwashed," Hryn commented. "Their way of life was different then. They wouldn't surrender, but would commit suicide first." "I forgive them," Omtvedt said. "I feel they didn't know any better. It was the result of their military training." "What's the use of holding bitterness and losing sleep over it?" Hryn asked. "I can't forget it, but there's no use holding malice and bitterness in your heart." "A lot of damn good men died," Bruer said. "A lot of deaths were due to despair. Once a man got in that mood, it was the end. "For four years we lived on rumors and the hope of liberation kept us going. Those who gave up hope were gone. We had to live day by day. "We learned the Red Cross sent medical supplies and food for the prisoners but they were shortstopped by the Japanese. After we were liberated we found those supplies stacked in warehouses." If there is bitterness among the four it is directed to the few of their fellow prisoners who collaborated with the Japanese for favors. "There was one lieutenant colonel who was a turncoat," Keilholz said. "He was responsible for the deaths of five guys that I know of. He was turned in but got off." Bruer perhaps best summed it up: "I saw Italian prisoners of war when I got back to the States. They were well treated and well fed. "Thank God I'm a citizen of a country that treats prisoners of war like that instead of what we've been through.